Sam Collins, right, is presented with his black-belt by coach Laurie Rush. 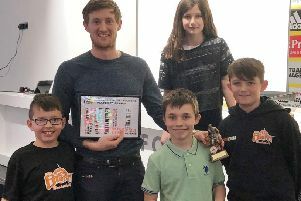 Talented Rush Judo teenager Sam Collins has earned his black-belt – the perfect way to celebrate the club’s 10th anniversary. It comes hot on the heels of Rush coach Salah Rabia’s black-belt achievement the previous week. Collins started training at Rush when he was only eight years old and was at their very first session in 2009. He continued training when Rush moved to their permanent dojo at Ashlyns School, Berkhamsted. Collins is now in his first year studying A-levels and is the first student from Ashlyns to get his name on the ‘Dan’ board there. A delighted coach Laurie Rush said: “Sam has been with me since the very beginning when we started Rush Judo. Collins is the No 2-ranked cadet (U90kg) in the UK and won a coveted bronze medal at the BJA British Nationals event in December. As well as being a successful judoka, Collins regularly supports the younger classes at Rush after successfully completing the BJA’s ‘First Steps into Coaching’ qualification. Over the weekend many of Rush’s coaches were supporting the club’s judoka countrywide. Guy Platten was backing members doing extra competition training at the club, while Trevor Westwood was in Walsall for the National Inclusion Day. Rabia was at the regional England squad session in Comberton.